We are very proud of the performance of Comodo Internet Security 10.1 in the AV-TEST review. The AV-TEST institute, an independent IT security and AV research organization designated Comodo Internet Security as a “Top Product” in February 2018 review. Comodo Internet Security scored 17.5/18 in the AV-TEST review. The product was examined under rigorous testing procedures before being acknowledged as one of the best protection software. The software’s evaluation process was continued during the months of January and February alongside eighteen other user cybersecurity products by using their standard/default settings. The protection product (CIS) was critically analyzed on the grounds of protection, performance, and usability. It has achieved maximum 6/6 in protection/detection and usability areas. It was also tested on the inbuilt reflex nature against all sorts of online threats. Basically, the test involved directly accessing known malicious websites and emails to identify the true defensive capabilities of the security product. The variance in examination helped researchers evaluate the full-capacity of Comodo Internet Security to fend off the unprecedented risks and threats. 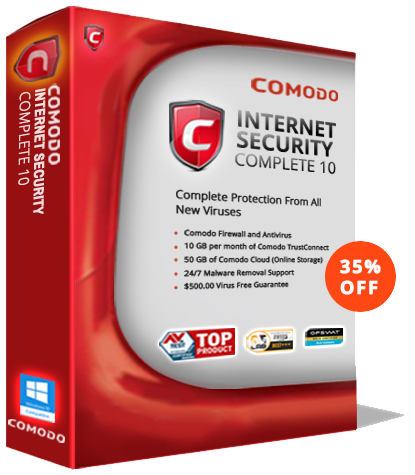 The Comodo Internet Security best-fits a wide range of online security needs. It perfectly serves as a powerful shield against all kinds of malware attacks. The software can be quickly customized effortlessly to cover all your cybersecurity needs. The top-class feature of the product is that it provides extreme protection for online banking and shopping activities for browsers. Virtual Desktop is yet another interesting feature. It can simply virtualize an Operating System and create a safe play zone for children and other users. This feature safeguards the inside content and doesn’t permit any malicious application or files to run. Sandbox technology ensures smooth functioning of applications in the virtual environment and locks-up all the malicious unknown applications, which could be potentially malicious into a virtual “Jail”. The AV-TEST is Germany based institute which is a pioneer in IT Security and Anti-virus research for over 15 years. It is situated in Magdeburg. The core team comprises of thirty IT Specialists who are experts in applying innovative mechanisms for performing tests. The research carried-out evaluates and rates security software for Windows and Android operating systems after running it through a variety of top-end test procedures. Every month, the test results are published on the website and awarded certification based on the findings. When a security software scores 17.5 points and above out of maximum 18, it receives the lab’s “Top Product” accolade. Download Comodo Internet Security today and stay protected against all malware attacks.